Hope’s room (one side of the master bedroom at the foot of our bed) is a beautiful place full of love. Faith’s spot is here at the foot of our bed, where she can see in the crib, and watch over ‘her baby’ while Hope is sleeping. Faith can usually be found napping on the foot of the bed, but at the slightest peep from the crib she’ll stand up with her feet on the foot-board and check to make sure everything is OK. Anytime she is out of the bedroom with me, if she hears Hope start to whimper or cry, she’ll race into the bedroom and jump up on the foot of the bed to check on her! Somehow I have a feeling these two are going to be inseparable as Hope grows up. Hope’s beautiful crib is a gift from my best friend Colleen. It was her crib when she was a baby, solid wood and nicely built to last a lifetime. I had looked thru store after store for a crib, frustrated at cheap materials, plastic parts, and shoddy workmanship. I remembered a nice quality crib my Mom used to have for years, but had given up on finding one like I was looking for made today. This crib is a perfect gift – it is exactly what I had been hoping to find for Hope! 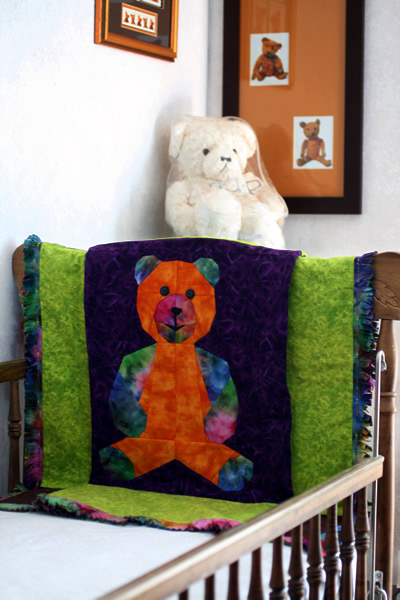 Joy’s gift to Hope is a gorgeous (and bright) teddy-bear baby quilt with shinny button eyes. I hang it over the foot of the crib, and at times I will catch Hope awake and staring at it. I think she is spellbound by the bright colors. I love the way her quilt brightens the whole room, and I know it was made with lots of love. Thanks Joy, even though you’re not here I think of you every time I see your quilt! 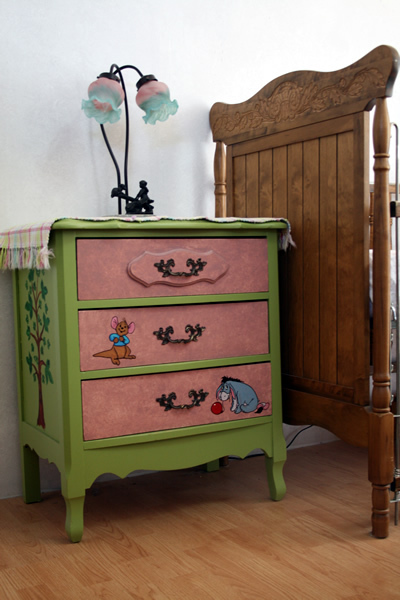 And last but certainly not least, Joanna hand painted a matching set of dressers that are adorably cute and compliment the room perfectly! 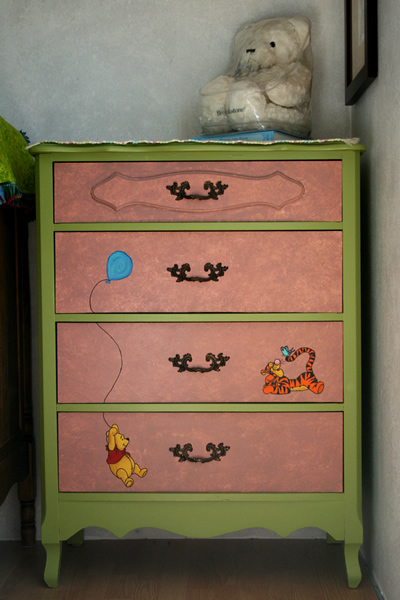 I had wanted to decorate the room with some teddy-bear images and pictures for the walls, so Joanna made the dressers in a Whinnie the Pooh bear theme. It is obvious a lot of love was behind all the work that went into these dressers. Naptime this afternoon ended up on a big fluffy pillow on the living-room floor. 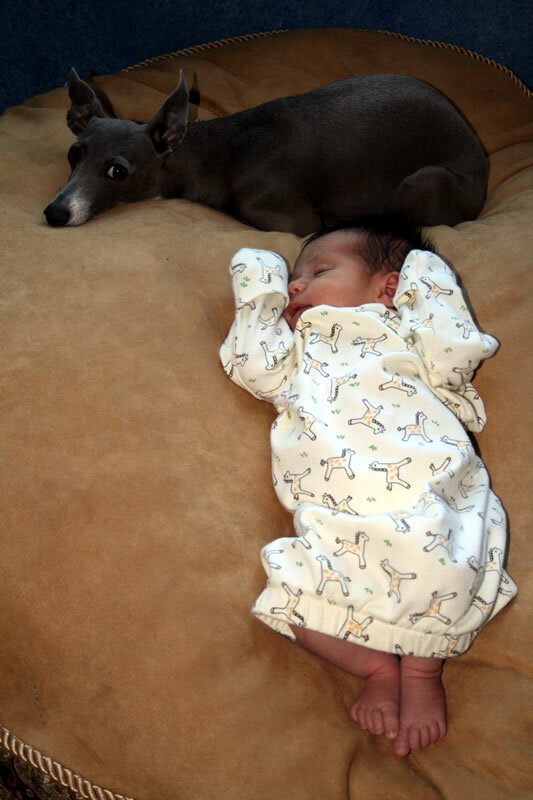 Faith, as usual, has to be right there anytime Hope is not being held – watching over ‘her’ baby. After a few minutes it turned into a nap together for the both of them. 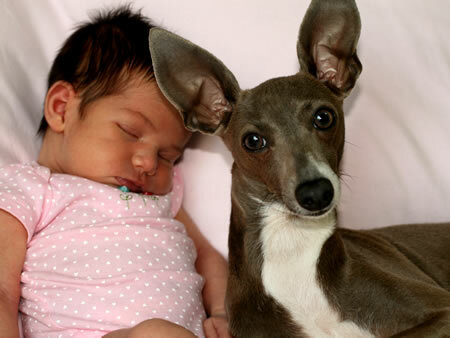 Hope is going to be one spoiled little girl growing up having her own personal little guard dog! Had to grab the camera and share! 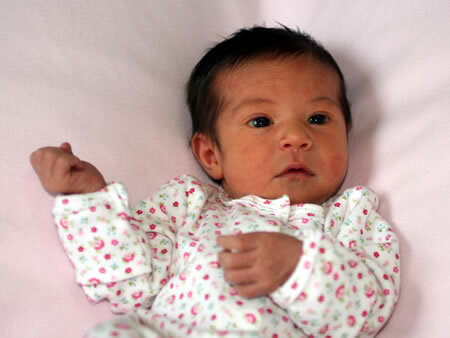 At 12 days old, she is a bright-eyed little beauty. It has been said a picture is worth a thousand words … So here’s four thousand to enjoy! 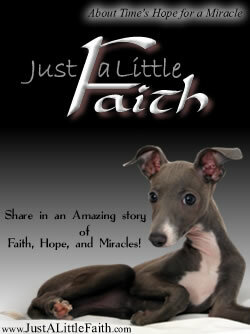 For anyone who has not met Faith and heard her amazing story, visit her website at www.JustALittleFaith.com to share her incredible story. This little dog has a very special place in my heart and life. I haven’t had the heart to break the news to her that she’s a dog though. Since I carried her for the first couple months of her life, I swear she believes she is a person. In fact, Richard has jokingly asked me when I am going to break the news to Hope that Faith is the true firstborn child in the family! Faith is my constant companion, always by my side, always in the room I am in, she sleeps in the bed with me, I swear she thinks she is a human. As my pregnancy progressed things changed a little, Faith learned that she was better off sleeping by my feet after the second time the belly bumped her right out of the bed. I had to put a doggie bed right by my feet when I am working on the computer after she no longer fit on my lap. She adjusted well though. 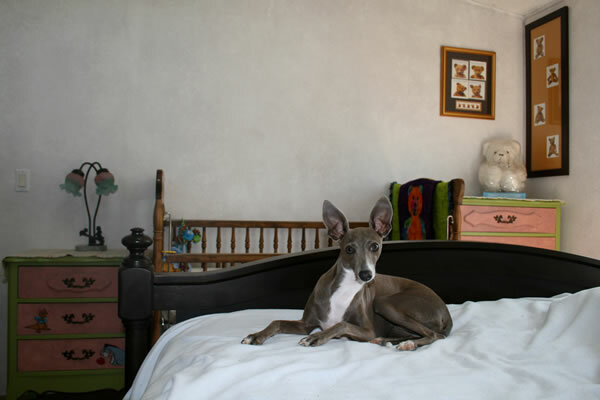 When I went into labor at home, I didn’t want to lock her out of the room, but didn’t want her underfoot getting in the way either… so I got her a soft crate with screen sides so she could easily see me from the adjoining room. She waited patiently for me to let her out, and though she had a soft bed in the crate, she spent the entire night glued against the front door watching and worrying about me. Every time I would moan she would whimper a little worried whine. I don’t think she slept all night. When we left for the hospital the next morning she was so worried – as soon as she was let out of the crate she bolted for the door and slipped out despite efforts to keep her in (I was already in the car). She ran straight for the car, jumped the seat and started licking my face. I had to hand her back to Richard to put back in the house, and we left. That was Friday morning. I didn’t come back from the hospital till Sunday afternoon. Richard made a couple trips back home during that time to feed and care for the animals, but Faith wouldn’t even go near him. Every time he walked in the door she would bolt across the room and bark at him. She must have thought he killed her mom (me) and buried my body somewhere and I was never coming back. 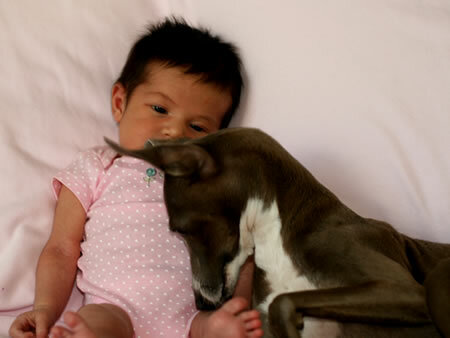 Faith was intrigued by Hope, she watched her intently, started sniffing her toes, and would watch so alertly every time Hope moved. Then Faith did something very interesting - she sniffed Hope, walked over and sniffed Richard, went back and sniffed Hope again, walked over and sniffed me, then went back and sniffed Hope again … and that was it. Faith laid down right by the car-seat and quietly watched her. 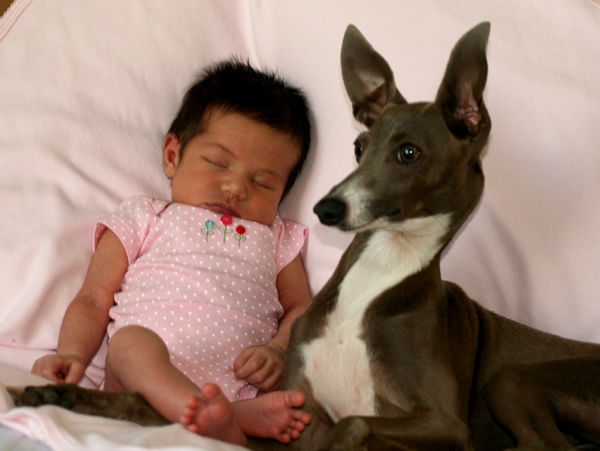 Faith has since adopted Hope as ’her’ baby. The crib is at the foot of our bed, and when Hope is in the crib, Faith will stand or lie at the foot of the bed and watch her in the crib. When we are out of the room and Hope starts to cry, Faith will be the first one in there watching to be sure she is alright. When I put Hope on the bed, Faith will lay right beside her, or will lay with her nose just touching Hope. When family and friends come to visit and hold Hope, Faith is very intent on watching every move they make with ‘her baby’. It is amazing to watch. My due date was on the 2nd. My sister Joy is leaving on Saturday the 10th to study for two years in the Philippines. She has been waiting (perhaps just a wee bit impatiently) all week for our baby to be born – so she can meet her before she leaves. I did get a fair amount of advice regarding eating hot foods etc. to hurry things up! Thursday evening a number of us were planning a ‘going away’ dinner with Joy before she left. Though Richard and I were invited, I am willing to bet she was secretly hoping we wouldn’t be able to make it as our new baby had arrived! Thursday rolled around and I had some very regular contractions that woke me up at 4AM. I got pretty excited thinking this was it … and then about 11AM they faded away. Ugh. Longer to wait. (not like I was past due and big and bloated and ready to be done or anything like that!) Looked like we were going to make Joy’s dinner after all that evening. That afternoon though, about 2:00 the contractions started back up again, strong, regular, but about 20 minutes apart. They were still 20 minutes apart at 5:00 when we got to Buccas for dinner and met up with Joy and everyone. By the time we ordered and food arrived at 6:00 though, they were coming 5 minutes apart and I didn’t even want to touch the food. At that point we decided to head home and get ready! We missed Joy’s dinner after all, but somehow I don’t think she minded a bit. 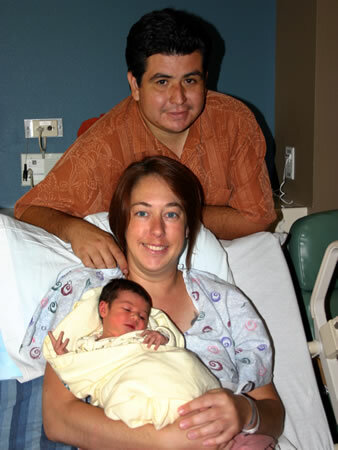 As I have a relatively strong dislike of hospitals and doctors, we planned on having a home birth with a midwife. I seriously got down to business Thursday evening, and made good progress thru my labor all night. Early Friday morning things seemed to hit a wall, and went for four hours of being “almost there” with no further progress. I was exhausted to the point of uncontrollable trembling across my entire body, and my back had reached the point where it was severely spasming with each contraction so badly that I could no longer focus. 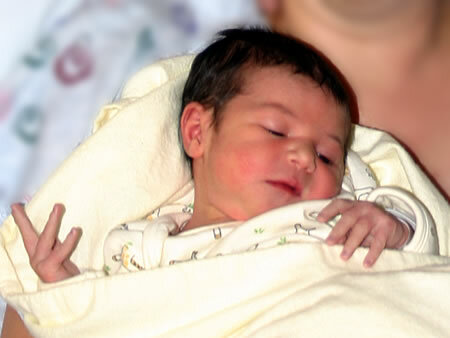 Due to nausea I had been unable to eat or drink all night, and by morning was so dehydrated that the midwife was unable to even get an IV started. All things considered, it was time to head to the hospital. Joy is completing her degree to be a midwife, and had worked for a local hospital so I called her and told her we were coming. (Reading between the lines there, I think it would be more accurate to say I was gasping at her between contractions and spasms to have someone with drugs waiting for me at the front curb when we arrived). She was incredibly awesome! Though she quit a couple weeks back (preparing to leave for the Philippines to complete her last two years of study) she was there waiting at the front of the hospital with a wheelchair when we pulled up. My mom was there as well when we arrived and she parked the car for us so Richard could come right in with me. Joy had me already checked in, a room waiting, a wonderful nurse and friend of hers (Candace) ready to take care of me, and a very nice Dr lined up as well. Seemed everyone in the place knew Joy and was glad to be able to help her sister. My contractions were less than a third of the strength they should have been – or needed to be to deliver – and by that point I was unable to do anything but curl up and cry every time the back spasms hit. I was given an epidural to control the back pain, and allow my body to catch a couple hours of much needed rest while on IVs to get re-hydrated too. The Dr warned me that if my contractions did not strengthen I might be needing a c-section, but I told him I thought things would be OK once I was rested and my back was not an issue. He said we’d be looking at waiting till that evening likely and see what progress was made. I can’t say I got much sleep, but I did get a couple brief naps in between the nurse visits (I strongly suspect that hospitals have a monitor that alerts them every time I drifted off so they could come by with another reason to wake me up!). After a couple hours I called the nurse and told her I didn’t know exactly why I was saying this, but I felt the baby was ready to be born … she said wouldn’t hurt to check, and was surprised to find I was right! We made a couple quick calls and Joy and my Mom came back (and Joanna came too), I started pushing at 4:15, and Hope Ann made her grand entrance into the world just 20 minutes later at 4:35! 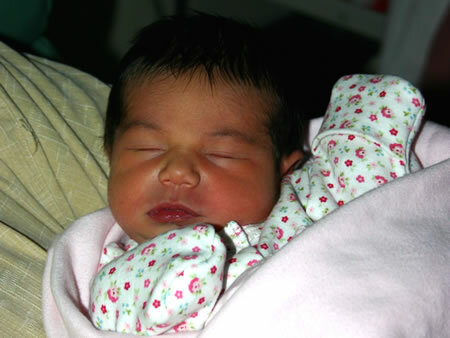 The first thing the nurse commented on as she was being born was lots of long dark thick hair – one of the heart monitoring probes on the side of her scalp was stuck in her hair when they tried to remove it! 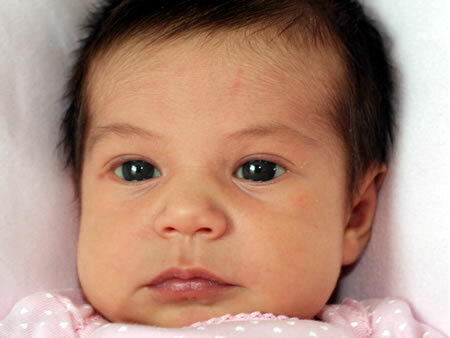 I think she looks like Richard, she has his head of thick dark hair for sure. 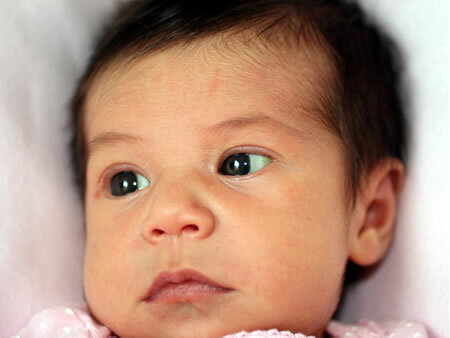 After she was born, she spent an hour laying on my chest looking all around with her big dark eyes. 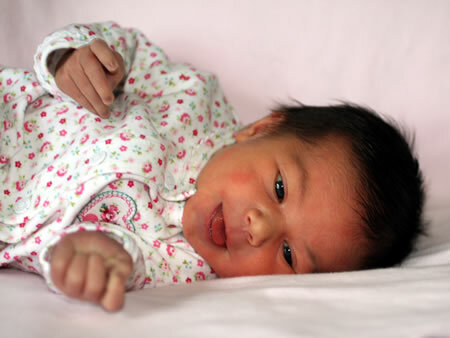 I absolutely love the first picture Richard took (it is in the first blog entry below) – it was taken just 5 minutes after she was born! 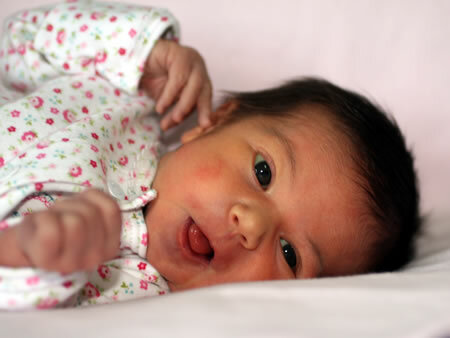 Though her birth was not as I had planned, it was a good experience despite the unexpected change of plans and ending up in a hospital. Richard was there with me the whole time, and my Mom and sisters Joy and Joanna got to be present for Hope’s birth as well. Though I had originally wanted a quiet home birth, it was very special to me to be able to have my Mom & sisters there when Hope was born. I know my eyes weren’t the only ones that filled with tears when she arrived. 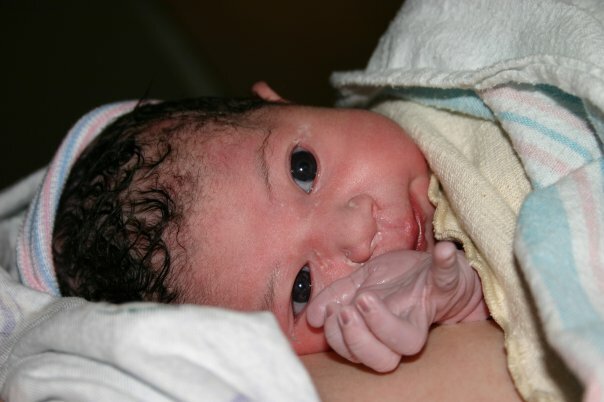 Newborn Hope, just 5 minutes after birth! 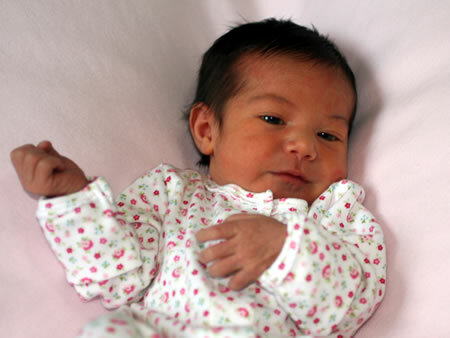 Our little bundle of joy arrived on 08.08.08, at 4:35 PM, weighing 6 lbs 10 oz, and all of 20 inches long (though if you measure from toe-tip to the end of her hair she has to be over 21 inches!). Her name is Hope Ann. Hope has been the name I hoped to one day choose for a baby girl for many years now, and it seems to fit her beautifully. Ann was chosen as her middle name as it is my mother’s middle name, and my middle name (her first daughter) as well. I liked the thought of continuing that through another generation. 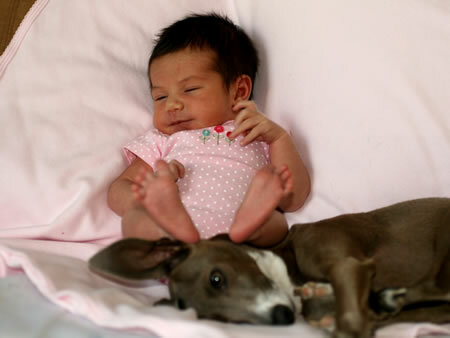 Who knows, perhaps one day my daughter will do the same with her first little girl.